“Each and every Friday night Luke Symonds takes the field, he’s one of the smallest players on the gridiron. As a 5’8”, 155 pound starter on the fifth-ranked CAM football team, Luke has never let his small stature be a deterrent to success. Instead, he’s used this challenge to not only motivate himself but encourage others as well. His coaches describe him as a tremendous team asset, a great team member who leads by example. While the CAM football squad has enjoyed recent success, the school’s baseball team has faced much adversity. Challenges include numerous coaching changes and rebounding from 0-22 and 4-18 seasons. As the lone senior on this year’s team, Luke has already begun planning upcoming projects that will positively impact future Cougar baseball programs. From organizing elementary skills camps to heading up fund-raising efforts for new dugouts, Luke’s dedication to his school’s baseball program is unwavering. 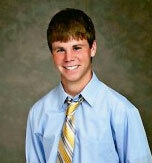 This enthusiastic team captain will use his experience and positive attitude to help rally this spring’s baseball team. Luke’s leadership spans far beyond athletics. The Boomerang Character Ed Program is a positive character-building program which partners high school students with elementary youth. Luke is one of only eight students selected by his teachers to serve as a Boomerang leader at the Anita Elementary. Over the course of twelve weeks, this young community volunteer encourages respect and responsibility while helping impressionable fifth-graders make wise choices. This CAM senior continues his volunteerism and service to others by being an active member of his church and youth group. Luke serves regularly in his church and is always eager to roll up his sleeves to assist with community betterment projects. For the past four years, Luke has helped organize and sponsor benefit basketball tournaments, involving youth from more than eight different communities. Designed to encourage fun and fellowship among teenagers, this annual event has also raised dollars to assist the needy with medical expenses and restock depleted food pantries.